VATICAN CITY (CNS) — Chinese Father Joseph Yue Fusheng has been automatically excommunicated for allowing himself to be illicitly ordained a bishop despite repeated warnings from the Vatican. “The Holy See does not recognize him as bishop of the apostolic administration of Harbin, and he lacks the authority to govern the priests and the Catholic community in the province of Heilongjiang,” the Vatican said in a written statement July 10. It also praised the new auxiliary bishop of Shanghai, Bishop Thaddeus Ma Daqin, who has been restricted by the government after saying he would give up his role in the government-approved Catholic Patriotic Association. Bishop Ma is the first government-approved bishop in recent years to announce publicly that he would give up his duties with the association, according to UCA News, an Asian church news agency. Father Yue was ordained bishop of Harbin July 6 without papal mandate following an acrimonious exchange of notifications between the Vatican and Beijing on the issue of illicit ordinations. The Vatican said that those bishops who took part in the July 6 ordination had “exposed themselves to the sanctions laid down by the law of the church,” which entail automatic excommunication. Bishops’ ordinations that are not authorized by the pope generally bring the penalty of automatic excommunication; however, because in some cases there may be mitigating circumstances — including fear of reprisal, necessity or serious inconvenience — those bishops in attendance “must give an account to the Holy See of their participation in that religious ceremony,” it said. Father Yue automatically incurred the penalty of excommunication because he “had been informed some time ago that he could not be approved by the Holy See as an episcopal candidate, and on several occasions he had been asked not to accept episcopal ordination without the pontifical mandate,” it said. On July 3, the Vatican issued a strongly worded statement warning Chinese authorities the ordination of Father Yue violated church law, jeopardized the future of the Catholic Church in China and would incur the automatic excommunication of any prelates taking part in the rite. The State Administration for Religious Affairs responded July 4, calling the warnings “outrageous and shocking” and saying self-election and self-ordination would continue despite the Vatican’s position on the matter. The Vatican statement expressed its appreciation for all those who prayed and fasted “for a change of heart” in Father Yue and for the unity of the church in China. “All Catholics in China, pastors, priests, consecrated persons and lay faithful, are called to defend and safeguard that which pertains to the doctrine and tradition of the church,” the Vatican said. “Even amid the present difficulties, they look to the future with faith, comforted by the certainty that the church is founded on the rock of Peter and his successors,” it said. However, “the presence of a bishop who is not in communion with the Holy Father was inappropriate and shows a lack of consideration for a lawful episcopal ordination,” it added. By July 9, government-sanctioned church authorities had not yet published any report on Bishop Ma’s ordination, although they published reports of Father Yue’s ordination. On July 8, Bishop Ma failed to show up for his first Mass at St. Ignatius Cathedral after telling the congregation at his ordination that he would step down from the local and national offices of the Catholic Patriotic Association to devote himself entirely to his ministry. Local church sources told the Asian church news agency UCA News that Bishop Ma has freedom of movement, but Chinese authorities have restricted him from exercising his episcopal ministry because they were displeased by Bishop Ma’s speech during his July 7 ordination. They said he spent July 8 in Sheshan, on the outskirts of Shanghai, where the diocese has a Marian shrine and seminary. Chinese officials “looked very serious when walking out of the cathedral,” one source said, adding that three tables reserved for government officials at the banquet following the ordination were left empty. 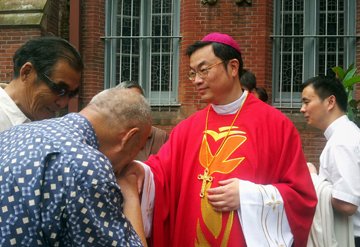 Late July 8, priests and nuns of the Shanghai Diocese received a text message from Bishop Ma saying he felt “mentally and physically exhausted” after his ordination. The message said Shanghai Bishop Aloysius Jin Luxian agreed to let him make a personal retreat at the shrine of Our Lady of Sheshan. A Shanghai priest said Bishop Ma was having a rough time. “It is painful, but is good for the conscience of the church in China. His witness is an encouragement for our Catholics, so we can only pray for him,” the priest said. Across China, many Catholics called for prayers and fasting for Bishop Ma July 9, the feast of Chinese Martyrs. 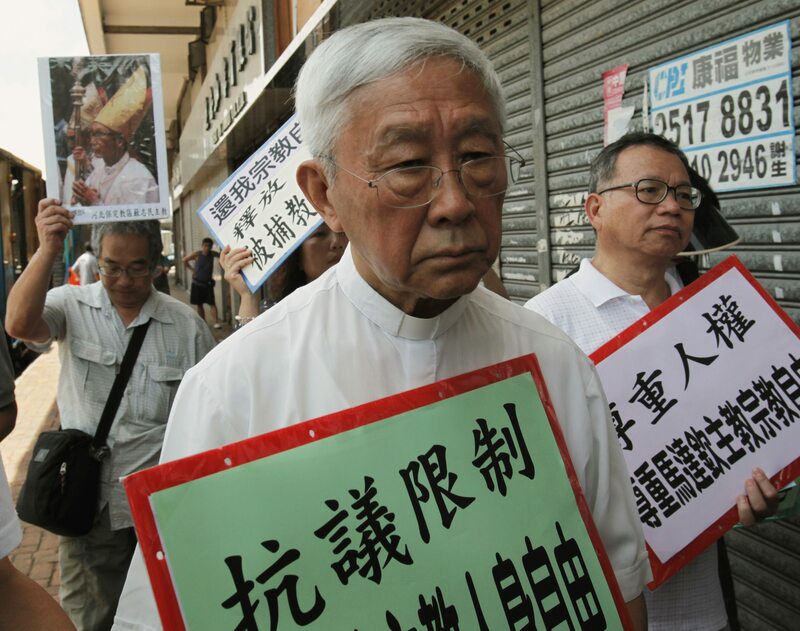 Anthony Lam Sui-ki, senior researcher of the Hong Kong diocese’s Holy Spirit Study Center, criticized the government’s interference in Bishop Ma’s right to participate in religious activities. “He has set a good example for other bishops in the country that they should be a spiritual leader for their priests, nuns and laypeople rather than (be) political leaders holding CPA posts,” said another church observer. Pope Benedict XVI’s 2007 letter to Catholics in China stated that the aim of the patriotic association in upholding the independence of the church in China was incompatible with Catholic doctrine.